Within a certain region (shown in gray) there is an external uniform magnetic field, and the magnetic field is zero everywhere outside of this region. A square metal loop of resistance R moves with constant velocity as it enters, then exits this magnetic field region. Discuss why the induced current flows in one direction around the loop as it enters the magnetic field region, then flows in the other direction around the loop as it exits the magnetic field region. Explain your reasoning using the properties of magnetic fields, forces, motional emf, Faraday's law and Lenz's law. Faraday's law and Lenz's law, where moving the loop downwards would increase the magnetic flux going into the page through the loop in (a), and decreasing the magnetic flux going into the page through the loop in (b); and from Lenz's law, these changes in the magnetic flux through the loop will be "fought" by an induced current that must be flowing counterclockwise in (a), and clockwise in (b). As (p), but argument indirectly, weakly, or only by definition supports the statement to be proven, or has minor inconsistencies or loopholes. 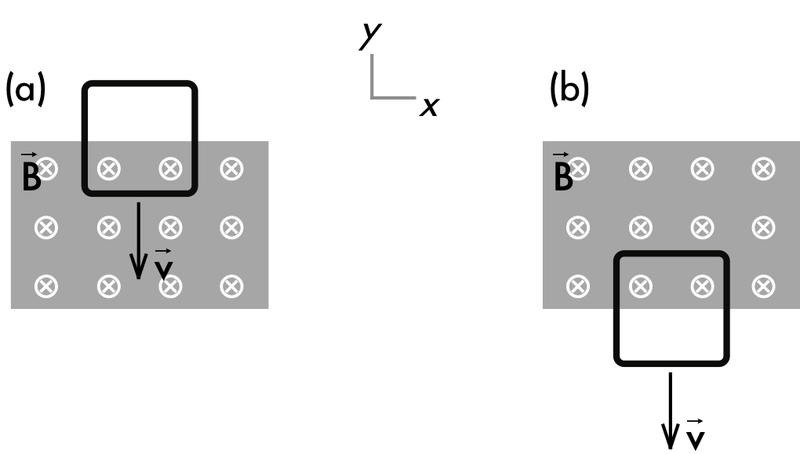 Directions of induced current are clockwise in (a), and counterclockwise in (b), but otherwise still systematically applies RHR1 or Faraday's law and Lenz's law. Limited relevant discussion of supporting evidence of at least some merit, but in an inconsistent or unclear manner. 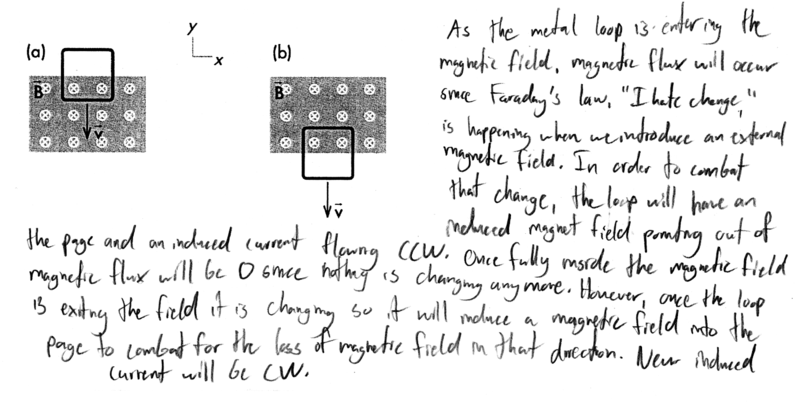 Some attempt at applying properties of magnetic fields, forces, motional emf, Faraday's law and Lenz's law. Implementation of ideas, but credit given for effort rather than merit. No clear attempt at systematically applying properties of magnetic fields, forces, motional emf, Faraday's law and Lenz's law.